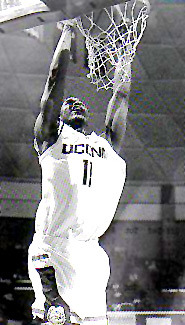 Hilton Armstrong was a Center for the UConn Huskies from 2002 – 2006. He played a key role in winning the 2005 Maui Invitational Tournament Championship, earning him a spot on the All Tournament Team. Hilton was also a member of UConn’s second National Collegiate Athletic Association Championship Team in 2004, and one of the most improved players during his four years at UConn, resulting in being selected 12th in the National Basketball Association draft to the New Orleans/Oklahoma City Hornets. I had the pleasure of talking to Hilton in October 2006, as he reflected on his basketball memories and experiences as he awaits his first year as an NBA player. As a youth growing up in Peekskill, New York, Hilton used to play basketball with his sisters and his friends for fun, but didn’t become serious about the sport until around the tenth grade. 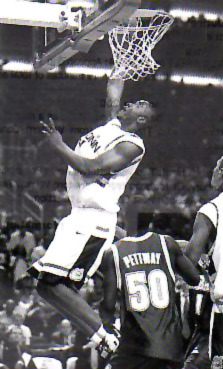 Although Peekskill High School’s boys basketball team didn’t win any state championships while Hilton was there, the team did reach the championship game when he was a senior, losing to Amityville High School, where UConn’s current player AJ Price was a freshman at the time. Another very interesting game in Hilton’s high school career was during a tournament in Springfield, Massachusetts. Coach Calhoun was there recruiting another player, saw and liked Hilton, and introduced himself to Hilton after the game. “[Coach Calhoun] introduced himself to me, and I was like OK, I really don’t know you but that’s OK.” Hilton at that time hadn’t really been that serious about basketball for very long so he hadn’t watched much college basketball. “When I told my teammates, they all knew Coach Calhoun, and said you have to go there (to UConn), they just won a championship a couple of years ago, and they were telling me what a great coach he is. I ended up going to UConn probably because my friends said UConn was the best school of all the schools that were recruiting me.” Other schools that had been recruiting Hilton were Boston University, Siena Heights University and LaSalle University whom he had verbally committed to but withdrew when UConn became interested in him. In June 2006, Hilton was picked 12th to the New Orleans/Oklahoma City Hornets in the NBA draft. He couldn’t have been happier to be pleasantly surprised, selected as high as number 12 and able to enjoy the experience with his family, and friends at Madison Square Garden in New York. Hilton ended our conversation saying that he will always try to represent Peekskill, New York in a positive way because that’s home for him. He tries to get back to Peekskill to see his high school teachers, and talk to the kids about his experiences as often as possible. He’s preparing for his first year in the NBA with daily workouts with the trainers and coaches. Hilton was always a fan favorite with the enthusiasm he showed, and he said the only thing that’s changed for him is his location.